Today I spent some time weeding the cold frames and they really are starting to look pretty. 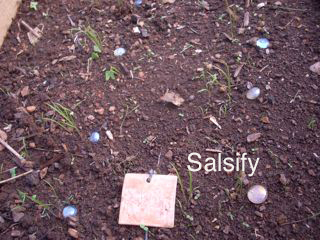 The radishes seem to be showing at the surface of the soil at the same time some little green worms are eating their leaves. I picked them off and tossed them out. I will have to check that regularly so that they don’t chew everything up. They have really chewed a lot of the leaves of the turnips as well. 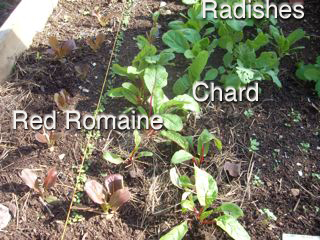 I have broccoli, cabbage, radicchio and Salsify all showing up. Salsify is a root vegetable and I am told that it tastes like oysters. I am really curious to see what it turns out to be. The seeds were these really pretty long pod like shapes and had a strip on them. Radicchio which is pronounced “rah dee kee o” is starting to show up and as I start looking at recipes, it is best grilled or wrapped around other foods. It is a chicory. Because it has a bitter flavor, grilling is supposed to make it more mild and more flavorful. 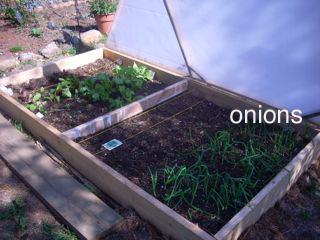 In Bed A I have the onion sets and we can probably start clipping the tops from those and adding them to our salads and recipes. 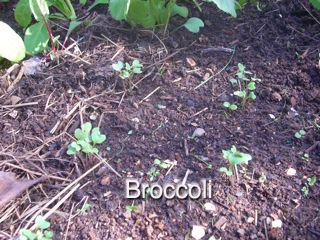 Beside them is a row of Spinach that I planted last week and I am not sure how viable the seeds are. The last batch I planted, only a few showed up. We’ll have to see. 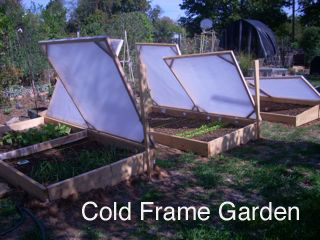 Susie Morgan Wilburn • This entry was posted in ...in the Garden, cold frames, vegetables. Bookmark the permalink.